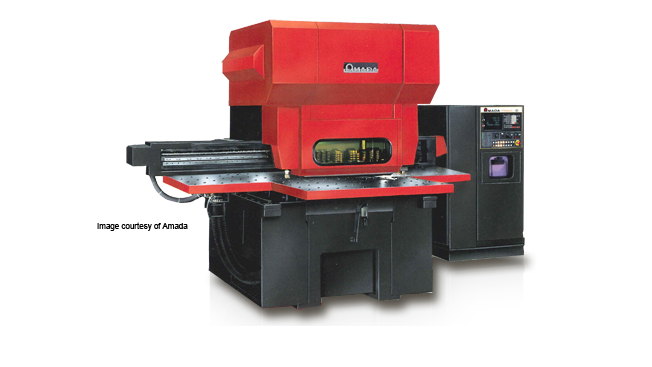 The Octo series from Amada includes this punch press machine as well as the Amada Octo 344. The price/performance ratio is excellent and makes this CNC punch machine very practical. The capacity is 33 tons and can handle a piece of sheet metal up to 29.5" x 39.37". It has the ability to handle eight stations at a time with one of those stations able to adjust to any angle. Sheet Metal Nesting software by Merry Mechanization can utilize these stations to the maximum capability. This Octo can be as accurate as you need it to be since it can increment as little as one thousandth of an inch.